The Georgian 8 room Town House KIT. We no longer do the Deluxe version. We can add extra windows or a French Door to any side of this house. All our Houses are manufactured using the most up to date CNC machinery and programming in our own workshop. 8 large rooms , central stairs to all floors, room dividers have doorway cut in them that will take a standard internal door. 3 dormer windows in the roof. Georgian Design also Victorian design available. Open the front of the house and the basement will open as well. Standard comes with Ready made Front Door (wooden), Windows bars are made from MDF, Stone surrounds around windows, Stair Treads to all floors. Hinges for Front and Roof. Size for both 910mm high (28") 762mm wide (30") 380mm Deep (15). Main house is Made from MDF. MADE IN WALES BY DHD Dolls House Direct. Our Houses are not made from thin or lightweight boarding. This house weighs about 20 Kilos. This is reflected in the cost of Post and Packaging. DHD dolls house direct aim to supply top quality miniatures accurately scaled to 1/12. Our British made dolls house food items look just like the real thing. Our own range of Houses / Shops are all inspired by real buildings. 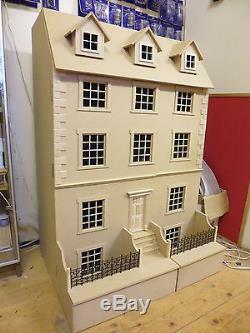 The item "Dolls House 1/12 scale Georgian 8 room Town House KIts by DHD" is in sale since Sunday, August 19, 2012. This item is in the category "Dolls & Bears\Dolls' Miniatures & Houses\Dolls' Houses".